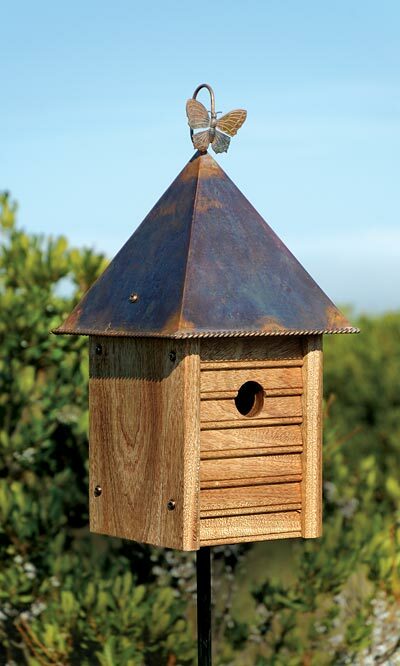 The Heartwood Homestead Bird House offers nothing but the best for your discriminating birds. This home features solid mahogany construction with beaded edge drop siding on the front, assembled with bronze plated screws for an added detail. The 1.375" diameter entrance hole is perfect for your songbirds, and a copper butterfly perches atop the roof for a touch of whimsy. A solid copper roof adds depth to the structure, and even more detailing may be found in the braided metal edging. A copper disc on the back of the house can be removed for seasonal cleanouts. The house may be hung using the included hanging hoop or pole mounted with a mounting plate (not included). Made in the USA.